Snowball is a dainty white cat, a spayed female, with soulful yellow eyes and a traumatic past, though she is less than two years old. In the spring of 2015, Home for Life® received a request for help from a rescue in the Twin Cities, the Gentle Touch Animal Sanctuary. Gentle Touch rescues and adopts out animals, and through one of their board members, learned of an elderly woman who was in the hospital under very dire and tragic circumstances. The woman, Snowball's former owner had been hospitalized after being severely beaten by her own son; this individual, who was living with her, was arrested and jailed. Apparently the domestic abuse had been an on-gong concern in this home for a long time and had finally reached a crisis point. Witnesses to this abuse of the woman by her son were her beloved pets, including Snowball. As one of the younger animals in the household, exposure to this violence seemed to leave Snowball extremely traumatized. The other cats in the house cowered or hid in fear after living with this violence in their household, but gradually came around after they were rescued, with the kind treatment given to them by the volunteers of Gentle Touch. Snowball however handled what she had experienced differently. No one really knew whether the animals had been abused by the son. However, Snowball was angry and frightened, and though now safe with Gentle Touch's rescue, the little cat seemed unable to distinguish her rescuers from the abusive son. Anyone who attempted to handle her or give her attention risked being attacked. Unlike feral cats who are wary of humans and avoid them, Snowball was not intimidated or shy of people, and would boldly approach anyone. Her pretty, dainty appearance caused people to imagine she was harmless, and then be caught off guard when she reacted aggressively. Reportedly, without warning, she would suddenly and unpredictably lash out if picked up or shown attention. Because of this behavior, the rescue felt that even a farm placement wasn't an option for Snowball. Because of the tragic circumstances, Gentle Touch wanted to make sure all the woman's pets found safe and loving placements, including the temperamental Snowball. The rescue asked if she could find a permanent home at the sanctuary, where she would be safe and never face the threats that she had experienced in her former home. It truly seemed that Snowball was not adoptable, nor would she be able to return to her home, as no one knew if of when her elderly owner would be capable of living on her own again after the abuse that resulted in her hospitalization. No one wanted the son to have any contact with the woman's pets either. Home for Life® wanted to do what we could to support the woman in her recovery so she wouldn't need to worry about her former pets as she healed, and to support Gentle Touch who had intervened to protect and shelter the woman's pets at this critical point. The summer of 2015, Home for Life® welcomed Snowball to the sanctuary. At first Snowball had a lot to get used to - many new feline faces and new people who would be caring for her. She missed her old owner and wanted to go back to the only home she had known. We kept her segregated in one of our isolation rooms for the first several days after she arrived, and gradually let her become integrated with her new group of cats in the north cattery. But Snowball wasn't sure of the other cats, and soon discovered the cat door to the attached outdoor run. One morning about a week after she arrived, we found that Snowball was gone. We searched everywhere on the premises for her, and soon some shreds of her white fur were found clinging to the fencing of the cat run. She had somehow managed to squeeze through an unbelievably small space between the cement of the cat run and bottom pole of the fence. We were concerned and distraught, as Snowball was not yet imprinted to recognize the sanctuary as her home base, and to our knowledge had never lived as an outdoor cat. Hoping her white coat would stand out against the green grass, and taking comfort that at least the weather was warmer, we searched everywhere for her but it was like looking for a needle in a haystack. If a cat doesn't want to be found they seem to be able to disappear into thin air (or melt like a snowball on a summer day). We set two different live traps, near the North cat run where she had escaped, baited with various canned foods. After just 36 hours, long enough for her to become hungry and tired of the adventure, Snowball walked into one of the live traps and then waited for us to find her which we did in short order. We all breathed a sigh of relief and got her situated again in the isolation room. However, we didn't realize the doorknob of the isolation room of the North cattery wasn't completely latching. In the middle of the night, Snowball managed to get the door open, get into the cat run, and again, she escaped. With this second excursion, she seemed much less committed to life as an outdoor cat, and this time we caught her in the live trap again the same morning we discovered her missing for the second time. Now, we sealed off the the small gap between the cement and bottom pole of the fencing where she had escaped each time - a space even our smallest cats like Callie couldn't get out of. Snowball decided she was home for life and settled in at last. Snowball has been affectionate with our staff, and seeks out attention. At first due to her history, we were a little wary when she approached, but it soon became apparent she meant no harm. With plenty of room to move around and climb, and with the freedom to go outside, Snowball does not feel cornered or threatened as she might if she were caged. She lets us pet her and with an all female staff, Snowball feels safe. 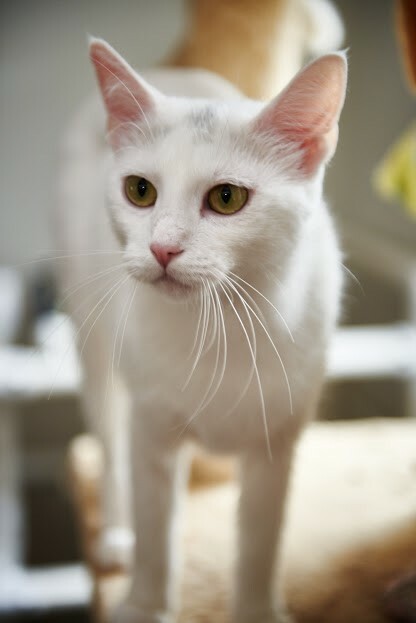 She loves any canned food made with seafood, and soon escape from the narrow gap of the cat run fencing became a concern of the past, because Snowball has gained some weight and filled out, becoming too big to make escape a possibility. What's more, running away doesn't interest Snowball anymore. She has made friends among the cats and our staff, and she knows she is safe at the sanctuary, where no one will ever hurt her or anyone she loves ever again. After overcoming trauma, heartbreak, loneliness and confusion in the first year of her life, Snowball has at last found the acceptance and security that she was searching for.